Retail investors often flock to two very different asset classes to reach their retirement goals. Two common investments seem to be real estate and publicly-traded stocks. Let’s look at these two different asset classes to compare their pros and cons. Leverage – Real estate is an investment that performs best when leveraged. As an individual investor, real estate can be levered 5:1 with a traditional loan with 20% down. Enterprising investors who can make use of FHA lending programs can borrow with only 3.5% down to purchase a live-in four-plex, offering far more leverage to the investor. Cash flow – Real estate is all about cash flow. Unlike dividend stocks, which might yield 3-4% at the most, real estate brings impressive cash-on-cash returns to the investor. Depreciation tax benefits are most beneficial to investors in a high tax bracket, seeing as property is depreciated over 27.5 years, which creates a tax shield for high-income individuals. Control – Real estate investors have much more control over their investment than an investor in a public company. Whereas you have full control to set rental prices, make new investments, and select tenants, minority owners of public companies have very little control over the day to day decisions to be made in publicly-traded companies. Time – You can’t passively invest in real estate like you might stocks. Real estate investing requires time and energy to find good properties and tenants. Investing in real estate is much more like running a business than investing in stocks. Operating leverage – The effects of real estate spill directly into your personal finances. Each dollar you borrow to buy real estate is a dollar of debt for which you, as an individual, are 100% responsible to repay. Furthermore, if rental units go without tenants, you have to cover the cost of debt service and maintenance out of your own pocket. Less active – It is significantly easier to be a passive stock investor as the day to day operations of the businesses you invest in are handled by someone else. More liquid – It’s much easier to sell $100,000 in stock than it is to sell a $100,000 home. The stock market is far more liquid of a market, making it a better investment for people who will need to make principle withdrawals in the future to cover living costs or immediate cash needs. No credit needed – There are plenty of companies on the stock market that are just as leveraged as your average real estate investor. However, these companies borrow on their own balance sheets, meaning that the investor isn’t required to carry debt themselves. When you buy into a public company you are not liable for losses should it go bankrupt. The same can’t be said of an individual investment in real estate. It’s all correlated – In the short-term, stocks move up and down with each other. The real estate market moves very differently, and home prices do not follow the ups and downs of the stock market on a day-to-day basis. You have no control – Unless you own 51% of a public company, or can persuade 51% of stockholders to agree with you, you have little to no impact on how a company performs or what it does going forward. This is very different from real estate, where the cash goes directly to the individual for reinvestment or deployment elsewhere. Shareholders are at the mercy of executives to make decisions that favor shareholder interests. No one stands in the way of a real estate investor who owns his or her own properties. All in all, the biggest difference between real estate and stocks isn’t in the returns, the leverage, or even the correlation. I think the biggest difference is the amount of time you’ll need to invest in either one. As a real estate investor, you are a business owner who has to set prices, deal with customers, and hire employees (contractors when necessary) to take care of your inventory (homes.) As an investor in the public stock markets, your only requirement is capital – you won’t have to listen to customers, hire workers, or manage your own business. You’re just a partner in a much bigger entity when you own stock in a company. Betterment: Passive investing couldn’t be easier. Determine your rick tolerance, slide the dial, and Betterment takes care of the rest. Try investing with Betterment today. Personal Capital: Need one place to see all of your assets? Personal capital is a free tool that allows investors to link all of their accounts within the secure platform. There’s never a need to login to individual accounts again. We have both real estate and stock investments – but I think we treat them largely the same in 1 regard. Our RE and stock portfolios are both highly diversified. For Stocks, we have small cap, large cap, Roth, not Roth accounts, Bonds, varied industries, etc. You are very diversified. I’m curious as to your strategy with the undeveloped lot. Is the goal just to wait it out and hope you can find someone who really wants to be in the neighborhood so bad that they’re willing to pay a premium for the lot and undertake their own construction plans? I know someone who had a lot adjacent to their home. It wasn’t acquired for investment purposes – it came with it – but it might have been the best investment on earth when the lot was sold a few years later. Very speculative, though! We purchased the undeveloped lot out of foreclosure about a year ago. It sits on a canal and has a concrete seawall along with a small dock (so it’s not 100% undeveloped – that’s about $50K+ worth of construction on the lot there alone – not to mention the boat dock is grandfathered construction, which is a big deal permitting-wise). Its location on the canal puts it about 10 minutes by boat to open water, which makes it a VERY desirable location within a boating community. Put simply, there are just not that many lots like this left in our area that are available for building, so we believe when the market rebounds there will definitely be a premium to be paid for it. We paid a little over $80K for the lot, where comparable lots had sold for over $600K in the boom years, and then had huge homes built on them. We’re not holding our breath for $600K by any means, but we do think it was undervalued at $80K, so we’re hoping the value reverts back to a linear progression over the previous 20 years, which would put the value around $300K. Our timeline is about 5-10 years for this hold, so we’re not in a big rush for profits. It’s definitely our riskiest real estate investment, but it was also our last investment in RE in the area for a while since prices are already rebounding pretty significantly. Sorry if that was too much detail – I tend to nerd out a bit when it comes to RE. There’s no such thing as too much detail; this is fascinating. I could read about people’s real estate purchases every day of the week. Sounds like you’ve really thought this through – and it appears to be a true value investment in real estate given that you basically paid $30k for the ground not including improvements. The permitting issue is really interesting, too. From a buyer’s perspective I can see where I’d rather buy your lot than chase a permit I may never get on an unapproved lot. Even at 10 years that’s like what…a 15% annual return? Not bad at all! Good comparison. We’re not in real estate, but would love to be and probably will be down the road. I think it can be a great way to diversify amongst your investments. I think it’s a great asset class for cash flow purposes. The fact that real estate prices and rents tend to go up in the very, very long haul makes it an interesting play. Good article! I think if you really have money to for long term investment, then real estate is the safer way to go. Though, it’s always good to diversify your investment, because you don’t really know which one will give you better earnings. I agree that real estate is probably safer insofar as predictability. It’s much easier to predict the returns from one home than 500 S&P 500 stocks 10 years from now. I like that it’s uncorrelated, too. Real estate investing is a whole lot more work than the stock market. Dealing with tenants and ongoing repair/maintenance is a huge headache. I’m starting to rethink my strategy. Yeah, one of the things that holds me back is the idea that I’ll have to deal with tenants. In rethinking your strategy, how would you change it? Go exclusively public companies, or just cut back on reinvestment in real estate? Hi JT, Another good post. You included most of the good points but you missed an important point(according to me) that is “MINIMUM INVESTMENT”. 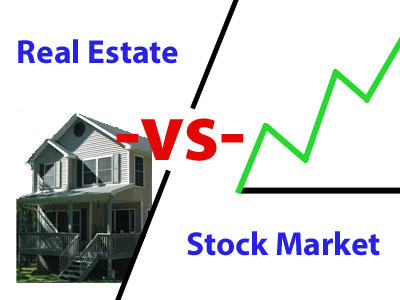 Stock trading can be started with $20 as well but it is not possible in Real Estate. Most of us cannot afford to invest in real estate in the most physical sense. But a great option to get started that provides the liquidity of stocks with an imitation of the income in a rental property could be seen in REITs. Obviously they hold their very own pros and cons but are definitely a great entry point into understanding real estate investing.